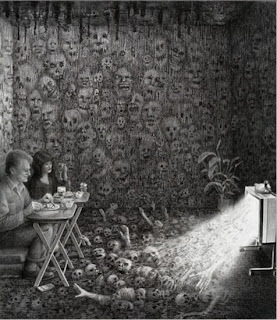 Had the real pleasure recently of meeting the American artist Laurie Lipton at a party thrown by mutual friends. I have long been an admirer of her work: mordant allegories and scenes of brooding banality finely etched in pencil that in no way prepare you for meeting the woman herself. If William Hogarth were ever to be reincarnated as a Mouseketeer, he might pass for a second Laurie Lipton. It is always tempting to read finely etched shadows and a precise attention to detail as being indicators of an equally precise and fine moral vision. However, the opposite is more likely the case: crosshatching, shading and an overabundance of detail suggests that there are nothing but grey areas. Whereas Blake sees only a single thin and wiry line separating the wise man from the knave, Hogarth and Lipton present moral relativism as a nightmare of the senses. We talked a lot about how the drugs and visionary madness of the sixties had their roots in 1950s suburbia and how the entire project could only end in one way: isolation, silence and alienation. Laurie also told me about a series of large works depicting housewives, blissfully unaware that they are trapped in dangerous ‘wired’ versions of the suburban home. Artist Cathy Ward said that she saw one of the new works while visiting Laurie at her new studio in Bethnal Green and that it is amazing.